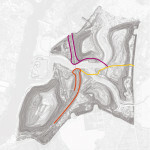 The first large-scale, public event was held at the Freshkills Park site in October 2010. Sneak ‘Peak’ was a one-day festival celebrating Staten Island’s landfill-to-park project as an icon for the 21st century. The event drew approximately 1,800 visitors.